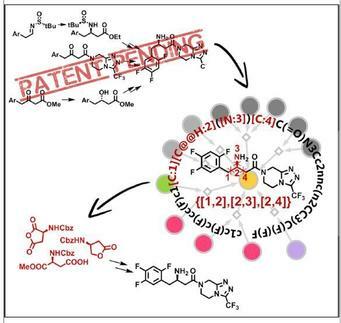 This graphical abstract illustrates how by identifying and keeping track of key disconnections essential to patent protected syntheses, a retrosynthetic computer program can autonomously design synthetic routes, ''navigating around'' previously published or patented approaches. Routes to making life-saving medications and other pharmaceutical compounds are among the most carefully protected trade secrets in global industry. Building on recent work programming computers to identify synthetic pathways leading to pharmaceutically complex molecules, researchers in Poland and South Korea have unveiled computerized methods to suggest only synthetic strategies that bypass patent-protected aspects of essential drugs.